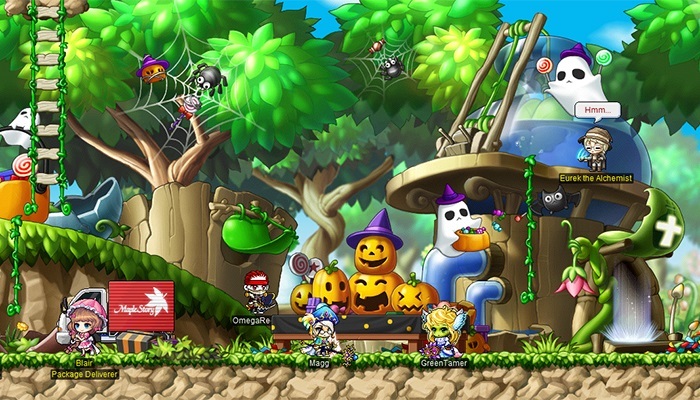 Halloween Events: October 18 – November 14 | Dexless, Maplestory Guides and More! Discussion in 'Maple Updates' started by Nexon, Oct 18, 2017. Halloween is upon us and Maple World has been overrun with creeps... creep-tacular costumes, eerie-tastic events, and spook-ilicious treats, that is! Participate in a cauldron-ful of events and splurge on goodies, including chairs, consumables and equips. And stay tuned for special events occurring on Halloween! The Madhouse Dungeon returns! Players Lv. 33 and above can begin by accepting the quest 'Chloe's Letter' from the star event notifier on the left side of the screen. You’ll receive a Visitor Access Card to enter the Madhouse with your friends Eddie, Marilyn, Chu, Lopez, and Sean. You can receive three additional Visitor Access Cards each day by completing the quest ‘Sender Unknown’. Explore multiple rooms and interact with objects to collect clues that will reveal the truth about the hospital. Read diary entries from Chloe and notes from hospital staff to learn more. Each room is a puzzle that must be solved within the time limit in order for you to exit. Keep your flashlight close and avoid powerful monsters lurking in the darkened corridors! You can earn more rewards by successfully completing specific quests. 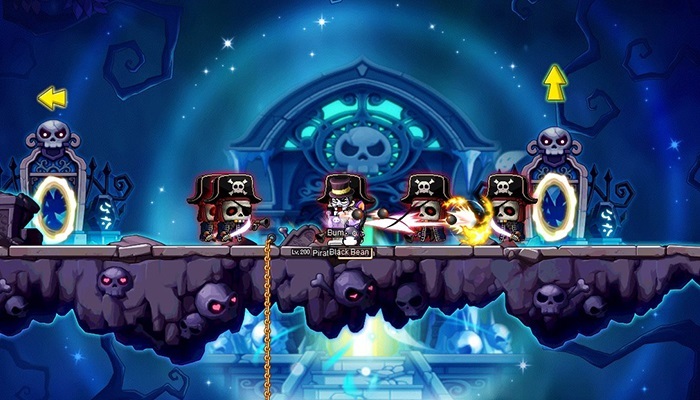 Venture deep into Murgoth Dungeon to face off against fierce enemies based on the five jobs of MapleStory! Take on the monsters by yourself in 1v1 mode, or join up with others in 2v2 mode. Players Lv. 75 and above can begin by accepting the quest ‘[Murgoth Dungeon Season 3] Beauty and the Beast’ from the star event notifier on the left side of the screen. Once you get inside, you have 30 minutes to find three Soul Shards before your opponent or opposing team. They are scattered throughout the dungeon, but the dungeon’s room arrangement changes each time you enter! There are three types of rooms in the dungeon. In Soul Rooms, you will be able to find a desired Soul Shard. In Warp Rooms, you have to clear the room of monsters. In Item Rooms, you can find and utilize helpful items. 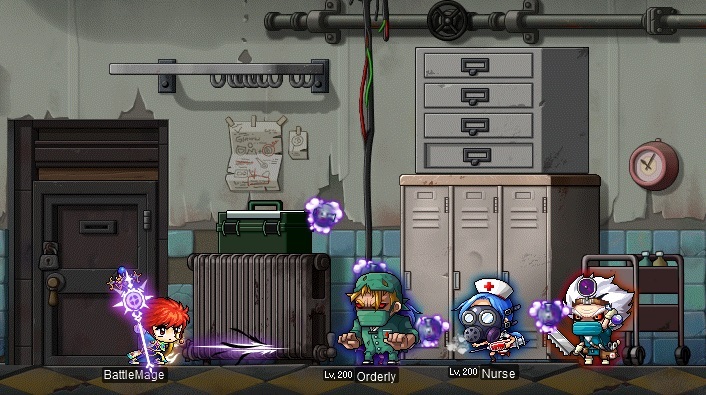 Fierce monsters that represent the five jobs of MapleStory are also waiting for you! How much damage you can inflict depends on your job versus that of the monster. When you complete the dungeon you can receive Spell Traces, Medals of Honor, Souls Shards, and more. You can enter up to ten times a day per world. Earn Murgoth Soul points when you complete the dungeon, which help you to reach different ranks. Whenever you attain a rank, you can receive a reward such as Spell Traces, Maple Reward Points, Selective 4 Slot Coupons, Murgoth Soul Shard, Epic Potential Scroll 50%, or a Murgothroid! You can also exchange your Murgoth Soul points for various items from NPC Murgoth or NPC Nine-Tailed Fox. NPC Murgoth has both stocked up on items including Murgoth Soul Shard, Customized Soul Enchanter, Honor EXP, Murgoth Traits, Murgoth Damage Skin, Murgoth Nine-Tailed Cape, and Necromancer Murgoth Chair. NPC Nine-Tailed Fox has Nine-Tailed Fox Traits, Nine-Tailed Fox Damage Skin, Together with Nine-Tailed Fox Cape, and Alluring Nine-Tailed Fox available. It’s the spookiest time of the year, and Hallowkitty is ready to celebrate! To get in the spirit of the season, Halloween decorations have been added to Henesys and Leafre and several combat functions are themed as well! Someone has placed witch hats on all of the Runes, and the Multi Kill/Combo Kill counter is decorated with spooky colors. Each day you can receive a fun Halloween mask to wear by accepting the quest ‘[Halloween] Hallowkitty's Daily Halloween Mask Gift!’. These are 1-day items that give 50 charm the first time they are equipped. If you collect all five masks, you’ll earn a two-week Halloween Mask Selection Coupon. Hunt monsters within your level range (20 levels below and 20 levels above) to collect Halloween Candy! Special Halloween-themed elite monsters are also carrying candy, so make sure to look for them too. And if you’re in Henesys or Leafre, Bully Jack may appear! Take down this giant pumpkin to earn even more candy. Open your candy to receive several different varieties including Pumpkin-Flavored Halloween Candy and Trick or Treat Candy, as well as a chance to obtain an Oversized Halloween Candy Chair. 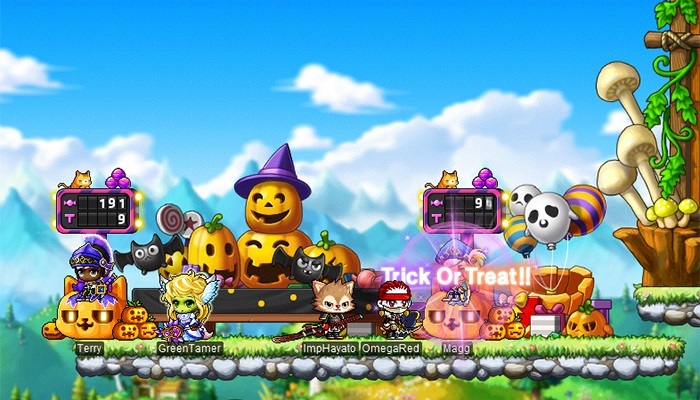 Complete the quest ‘[Halloween] Hallowkitty's Halloween Bash!’ to receive a Trick or Treat Chair! Save up your Sharable Trick or Treat Candy and then take a seat. When other players click on your chair, they’ll receive a piece of Shared Trick or Treat Candy from you! Share candy with others enough times and you’ll be rewarded with the Halloween Cat-O-Lantern Mask and Halloween Candy Hoard Chair. Your trick-or-treating prowess is also measured on a ranking that charts the top 10,310 players. Rank 1 – 100: Receive a Hallowkitty Damage Skin, Hallowkitty's Witch Hat, and Oversized Halloween Candy Chair. Rank 101 – 1,031: Receive a Hallowkitty Damage Skin and Hallowkitty's Witch Hat. Rank 1,032 – 10,310: Receive a Hallowkitty Damage Skin. Accept the quest ‘[Halloween] Hallowkitty's Halloween Bash!’ to receive a Cat-O-Lantern Summon, which follows your character around all season. Consume Pumpkin-Flavored Halloween Candy to enhance the stats of your Cat-O-Lantern Summon. As you keep eating candy and enhancing your stats, the Cat-O-Lantern Summon will level up, and its size and appearance will change. 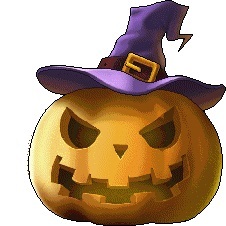 The Cat-O-Lantern gives you increases to your Attack Power/Magic ATT, Critical Rate, ignore enemy defense, and increased damage when attacking regular monsters or bosses. As you grow your Cat-O-Lantern Summon you can earn daily rewards (per world) when your Cat-O-Lantern meets the required level. Halloween Mask Selection Coupon: Untradeable, 14-day duration. Use the coupon to receive one of the following Halloween masks! Get supremely spooky for Halloween by helping the Dark Lords of Darkness recover their lost items! Collect talismans dropped by defeated monsters to complete each of four sub-quests. For each sub-quest that you complete, the quest item you received will transform into a 1-day equip.